I travel … a lot. If you read my blog on any sort of regular basis, you know that I usually find myself on an airplane at least 3 or 4 times a month. While I do enjoy an adventure, it does take a toll on my body. I’m getting older, but that’s not the main issue. 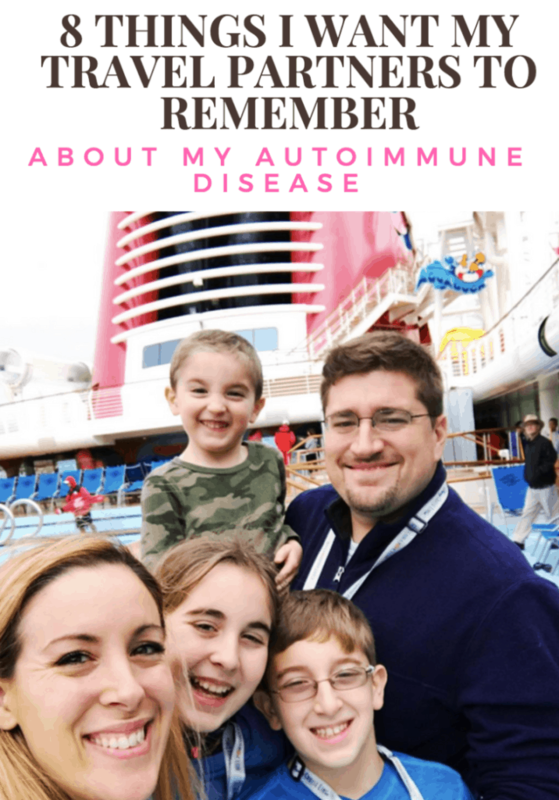 My struggle with travel has more to do with the fact that I have an autoimmune disease. Hashimoto’s Disease is a silent inhibitor. You can’t physically tell there is anything going on with me. In fact, I look pretty “normal” at first glance. That’s why it so hard to justify my exhaustion to a third party because from the outside looking in, it doesn’t make logical sense that I don’t feel well. But I burn out like a candle lit on both ends. When my time is up, I completely shut down and when you are in the middle of a tour in a foreign country, that isn’t the best scenario for everyone in your party. Other people who have autoimmune diseases understand what I am saying. We just need to be understood and plans need to be adjusted accordingly. I want to see the world. I want to explore every cave, creek, and cavern. I want to step foot in every country that’s written on my map… but I need to do it on my terms. I’m not making this up. I’m tired. I’m winded. I’ve lost all my energy and it’s not because I want to slow the group down, but it’s because my body has had enough. I can’t tell when I’m going to hit the wall. It could happen in a few hours or it could happen right away. But when it comes, it’s like a ton of bricks and I need everyone to acknowledge me. If I say it’s ok for the group to go on without me, please do. This isn’t some plea to get everyone to cancel their plans. I truly want everyone to continue on and enjoy their day – even if it means I miss some fun so I can go back to the hotel and take a nap. I would prefer to schedule two-thirds of my day and have one-third of my day set aside to relax. This is a great ratio for me. So, if we tour in the morning and go back to the hotel for lunch, that gives me enough time to reset for another big push in the evening. I just need a little bit of time to refuel. I’m upset that I was born this way. Please don’t make me feel bad about my autoimmune disease. I wish I was one of those moms who has energy bottled up – enough to share in fact! But that’s not the hand I was dealt. We are playing a different game and it is what it is. What seems simple for you might be very overwhelming for me. A quick hike or an all-day museum tour can feel absolutely daunting to someone with an autoimmune disease, especially if I woke up not feeling my best. I can gauge how I’m going to feel most mornings – please listen to what I am saying. Again, I’m not trying to control the whole trip. I’m just trying to manage expectations. Some days I can go an entire day without noticing a decrease in energy. Those are great days! But they don’t mean I am cured. Let’s relish in those moments and take lots of pictures. I am not my disease. I am so much more. If I have an episode, it will pass. If I don’t have an episode, one will come. But I remain one true constant. My love for travel shines through. My desire to learn more about what this world has to offer will always exist and I hope that my children see that! Do you have an autoimmune disease? What do you want the world to know about you? I know exactly what you’re feeling. I have congestive heart failure and exhaustion is a daily event. I don’t look old enough to have it, nor do I look like I have it. Every day I wake up hoping it’s a good day. I do the same thing. And when it is a good day I am very grateful 🙂 Thank you for commenting and sharing your story! Thanks for sharing this with us! My father had lupus, and I think some of my family regarded him as anti-social while he was trying to deal with the effects of his disease. We all need to remember that people are fighting battles we cannot see! These are helpful tips and good reminders. Fighting battles we cannot see — I love the way you said that. YES. Thank’s for this post. It’s a very essential post for a traveler. I also share a things about a baby stroller that will be very helpful for you carrying baby from anywhere.